Bridge Technologies' upgraded PocketProbe app will be on display at NAB 2018. Engineers and producers need the best new technical tools to monitor and verify that their TV signals are of the most impeccable video and audio quality. Nowhere else in the world will more of the latest TV Test & Measurement equipment be actively on display than a Las Vegas NAB Show and 2018 will be no exception. Exhibitor expected to display the latest TV T&M gear are listed in alphabetical order. Bridge Technologies has a significant NAB announcement to be finalized on April 4th. Depending on when it is formally announced, you will read it first in The Broadcast Bridge, or visit the Bridge Technologies NAB exhibit to find out. What has been most recently announced is an update of its PocketProbe app. PocketProbe enables objective post-CDN analysis of real network performance in a streaming media environment. PocketProbe is now 64-bit compatible and available for download on both iOS and Android. 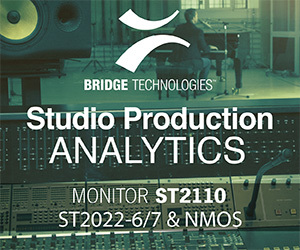 The updated apps incorporate the latest version of the OTT Engine at the heart of Bridge Technologies’ popular VB series of media monitoring IP probes. These enable analysis and confidence validation of HTTP variable bit-rate streams from any location. PocketProbe can provide continual validation of OTT streams, with detailed analysis of HLS, Smoothstream, RTMP and MPEG-DASH, and at-a-glance displays that present data in instantly-understandable form through graphic displays and multiple overlays. The app can be used by service engineers and operational staff to test real world behaviors with a wide range of operators. Accurate status of bit-rates used and profile changes is displayed in real time, giving instant understanding of provider delivery capability. Together with hardware probes used pre-cloud, the post-cloud location of the PocketProbe enables excellent correlative understanding of CDN and provider abilities. Several new features have been added to the Interra Systems' Baton line. Interra Systems will demonstrate new features for Interra Systems' QC and monitoring solutions, including exhaustive QC checks, adaptive bit rate (ABR) stream validation, real-time quality of experience (QoE) measurements, live content monitoring, and deep-dive compressed stream analysis. The newest version of Interra System's BATON QC solution leverages Artificial Intelligence and Machine Learning-based advanced algorithms, and includes the industry's first support for the VAST protocol, hybrid QC workflows, and enhanced support for HDR content, audio language detection capabilities, and more. BATON's new auto-scaling feature, lets service providers adjust their BATON system to handle peaks in QC content, as needed. It supports a wide range of new codecs and formats. BATON+ QC and the new data analysis features for BATON+ allow users to effectively track trends and anomalies in media content, optimizing decision-making and QC operations. The latest version of ORION-OTT features an edge performance monitor (EPM) for true, end-to-end monitoring. The EPM integrates with third party device monitors to collect critical QoE parameters. ORION-OTT also includes a new origin performance monitor for active and passive monitoring of origin servers, with the capability to monitor average response time and bandwidth served, server availability, and HTTP response codes. New ORION features include extended checks for live monitoring, support for VANC closed captions (SMPTE-2038), and the capability to view and monitor VANC EIA-608 and VANC EIA-708 CC data. The VEGA media analysis solution for standards compliance, debug, and interoperability of encoded streams will also be demonstrated. The Leader LV5333 HDR option will be shown in the company's exhibit. Click to enlarge. Leader Instruments will be demonstrating its new LV5333SER02 function to evaluate HDR video signal by picture display and waveform display. The option can be installed on an existing LV5333. In the picture display, HDR can be checked easily the luminance distribution by coloring according to the luminance of the HDR area. In the waveform display, level management including the HDR area can be performed by the HDR scale. Although it is for 3G / HD-SDI, it can also support 4K HDR display by using 4K 2 sample interleaved 1 signal or HD monitor output from 4K camera. It is compatible with Various HDR Standards, supports HLG (Hybrid Log Gamma) conforming to ITU-R BT.2100, ARIB STD-B 67, SMPTE ST 2084 and PQ (Perceptual Quantization). It also supports S-Log 3, C-Log, Log-C.
Also on display will be Leader’s new, 1U, half-rack, LT4600A Multiformat Video Generator applicable for 3G-SDI, HD-SDI and SD-SDI systems. Various output capabilities, such as color bars, SDI check field test pattern, ID characters, logo mark in QVGA size, safety area marker, embedded audio, genlock function for external reference synchronization, and three independent analog black signal systems. Lip Sync is one of the key features included in the product. The Omnitek upgraded Ultra TQ will be demonstrated in the company's exhibit. Click to enlarge. Omnitek will be showcasing its new Ultra TQ with full audio support at this year’s NAB. After its highly successful launch at the 2017 NAB Show, the Ultra TQ has become a network connected Broadcast Waveform Rasterizer supporting both SDI up to 3G and SMPTE 2110 / 2022-6 IP connections. For the 2018 NAB Show, the Ultra TQ has gained the ability to analyze and decode Dolby E and D audio for monitoring and quality checking, the ability to de-embed SDI / 2110 / 2022-6 audio content to AES/EBU Audio outputs as well as the ability to monitor AES/EBU Audio on discrete audio connections. 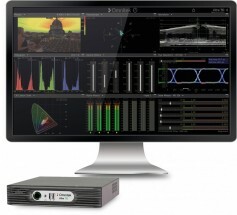 Also, on display at NAB will be Omnitek’s Ultra XR 4K/UHD Waveform Rasterizer running V3.4 software, and Omnitek’s Ultra 4K Tool Box 4K/UHD Analyzer/Generator/Converter running V3.4 software. Included in the V3.4 release are Lissajous display, AV Delay measurement, Propagation delay measurement, new status displays and many other features and improvements. On Omnitek’s Design Services area on the booth we will be demonstrating our new OSP (Omnitek Standard Product) silicon chipset solutions for 4K AV over IP and 4K / HD Warp as competitive alternatives to ASIC and ASSP devices. Omnitek will be adding AV over IP and video warp Chipset solutions to its Design Services and FPGA IP-cores at NAB, giving equipment manufacturers more access to the company’s expertise in 4K and higher resolution video designs. Applications range from camera to display, including lens corrections, image stitching, raw sensor and High Dynamic Range processing, scaling, mixing, connectivity and overlay graphics. PHABRX’ trademarked RTM provides critical transport layer information. Click to enlarge. PHABRIX will present SMPTE ST 2110, ST 2022-6, HDR and 4K/UHD test and measurement solutions at the 2018 NAB Show. PHABRIX will be demonstrating its full range of IP, UHD and HDR solutions in its booth, including its latest Qx series, portable Sx range and rack-mounted Rx series. The PHABRIX Qx Series IP/12G-SDI, 4K/UHD and HDR Generation, Analysis and Monitoring will be on display and explained. PHABRIX’s top of the range Qx Series will be shown with the latest hybrid IP/SDI test and measurement tools required for the transition to the next generation of video formats. The Qx IP now offers SMPTE 2110 with PTP and 2022-6 support. The Qx Series new 12G-SDI STRESS option will make its NAB show debut, providing an advanced toolset for SDI interface stress testing. Together with the Qx Series’ fast, automated 12G-SDI physical layer analysis with Real-Time Eye technology, provides a world-class solution to SMPTE compliance verification. The Qx Series now offers support for Hybrid Log-Gamma (HLG) and S-log3, enhancing the visualization and analysis of 4K/UHD and HD content. The series’ new remote interface will also be demonstrated, employing VNC technology to deliver 16 simultaneous scalable instrument windows backed by a new powerful preset mechanism. The Sx Series portable generators/analyzers for hybrid IP/SDI and physical layer testing now include support for the latest SMPTE ST 2110 and SMPTE 2022-6 decapsulation/encapsulation. PHABRIX’s Sx TAG is the go-to handheld test and measurement instrument for the world’s most advanced broadcasters and broadcast manufacturers. PHABRIX’s rack-mounted Rx Series delivers 2K/3G/HD/SD signal generation, analysis and monitoring for faster compliance testing and fault diagnosis of video and audio. It’s ultra-flexible, user-defined instrument layout can present up to 16 instruments simultaneously, ranging from full screen to 1/16 screen. PHABRIX will be demonstrating the Rx’s advanced diagnostics tools including Real-Time Eye and jitter physical layer analysis instruments, plus CC, loudness and Dolby monitoring. The R&S PRISMON can be seen in the AIMS Interoperability Showcase. Click to enlarge. Rohde & Schwarz will show its acclaimed R&S PRISMON multiviewer, an advanced content monitoring for broadcast and streaming media services. As a part of the AIMS NAB 2018 Interoperability Showcase, a R&S PRISMON will be running interoperable implementations of the latest drafts for SMPTE 2110 and AMWA IS-04 in a live environment. Rohde & Schwarz will demonstrate how R&S PRISMON is applicable to the broadest range of scenarios including Playout, Production, Contribution, Distribution and Cloud environments. Reporting is another key focus with combined data rates, stream types and resolution reporting, thereby reducing management complexity in modern media operations. The Tektronix WFM8200 gets expanded support for 4K/UHD, HDR and WCG. Tektronix promises a busy NAB exhibit with a host of new products and upgrades. A new Sentry update adds expanded support for OTT/video cloud workflows, ad-insertion monitoring, and CMAF Support for live and on-demand video content quality assurance to cloud, and virtual workflows. The new Sentry capabilities for OTT streaming service monitoring include Ad Insertion Monitoring for ABR, Common Media Application Format (CMAF) support, Sentry monitoring for AWS MediaLive and MediaPackage, 4K and HbbTV DASH streaming enhancements, and Google Cloud Platform (GCP) live streaming. Other Sentry enhancements include Video on Demand (VoD) ABR testing, HTTPS secure stream support, and cloud-based subscription support. Tektronix will also show expanded support for 4K/UHD, HDR and Wide Color Gamut WCG across its full range of content monitoring platforms including the small form factor WFM/WVR5200 series waveform monitor, WFM/WVR8000 series waveform monitor and the PRISM IP/SDI monitoring and analysis platform. New PRISM software adds support for conversion from ITU BT.2020 to ITU BT.709 as well as from S-Log, LogC, PQ and HLG to ITU BT.709 that can be applied to picture, waveform, vector, and diamond displays. This allows users to leverage their familiar displays in ITU BT.709 color space for HDR/WCG content creation. The PRISM media analysis solution also now includes support for the recently published SMPTE ST 2110 suite of standards (-20,-30,-40, -21) for professional media over managed IP networks. The Triveni StreamScope Portal analyzer has advanced to Portal II. Triveni Digital will be showing the next generation of its popular StreamScope Portal analyzer product line, the StreamScope Portal II. The StreamScope Portal II simplifies troubleshooting of DTV transport streams through its sleek two-in-one hardware platform design, high-res touch-screen interface, advanced RF spectrum analysis capabilities, rules-based troubleshooting, and ultra-portability factor. The StreamScope Portal II can be upgraded with professional ATSC 3.0 analysis capability via StreamScope XM MT software, enabling users to deliver flawless services during the next phase of broadcast television. "As the broadcast ecosystem becomes more complex, there is a greater chance for errors that can degrade audio and video quality, or interrupt services altogether," said Ralph Bachofen, vice president of sales and marketing at Triveni Digital. "Our new StreamScope Portal II offers an unequaled level of portability and convenience for professional video analysis, monitoring, and troubleshooting, ensuring that broadcasters can cost-effectively handle quality assurance issues now and in the future as they make a seamless migration to ATSC 3.0." StreamScope Portal II gives users access to a wide range of MPEG quality assurance metrics, including video thumbnails, audio graphs, metadata tables, PID details, EPGs, IP routes, GOP frames, and advanced RF spectrum analysis. Its compact package is ideal for field testing transport streams at multiple locations. Featuring a convenient and flexible gateway, StreamScope Portal II handles a variety of input options (i.e., Ethernet, ASI, and basic or advanced RF). It can connect to other StreamScope analyzers and remote monitors, as well as to Triveni Digital GuideBuilder metadata management platforms, to provide a complete systemwide view of the health of video distribution plants.